The primary purpose of the standard is to address the current accounting treatment of operating leases which are deemed to be off balance sheet financing arrangements and are only disclosed via a company’s financial footnotes in the “Commitments and Contingencies” footnote. Upon the adoption of ASC 842, for every identified lease, companies will be required to create a lease liability calculated as the present value of the future fixed payments and a corresponding asset (“right of use” asset). The right of use asset will be amortized over the life of the lease. The income statement will be impacted by a straight-line lease expense item that would essentially contain an interest component with the amortization of the asset being the plug-in order to achieve straight line lease expense over the life of the lease. One of the key challenges of adopting the new standard will be for companies to assess and apply the incremental borrowing rate applicable to them which will be used in the present value calculations for the capitalization of lease liability and right of use assets related to leases. The new leases standard will significantly affect lessees and lessors in the real estate industry, including their considerations related to non-lease components, initial direct costs, and accounting for sale- leaseback transactions. In addition, real estate lessors will need to understand the standard’s broader implementation implications for lessees as well as the potential for changes in tenant behaviors. Lessees and lessors are required to separate lease components and non-lease components (e.g., any services provided) in an arrangement and allocate the total transaction price to the individual components. Lessors would perform the allocation in accordance with the guidance in the new revenue recognition standard, and lessees would do so on a relative stand-alone-price basis (by using observable stand-alone prices or, if the prices are not observable, estimated stand-alone prices). 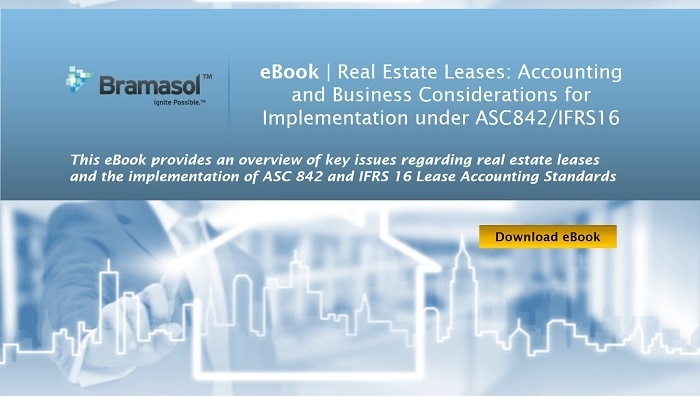 This eBook will help you explore different accounting treatment for property taxes and insurance, Variable Lease Payments, Initial Direct Costs, Sale-Leaseback Accounting, and at the end best part is Business Impact and Implementation Considerations. As crunch time is here for ASC 842 and IFRS 16 compliance, Bramasol can still help you comply on-time. Ask us how!